Stopped working after less than 6 months. 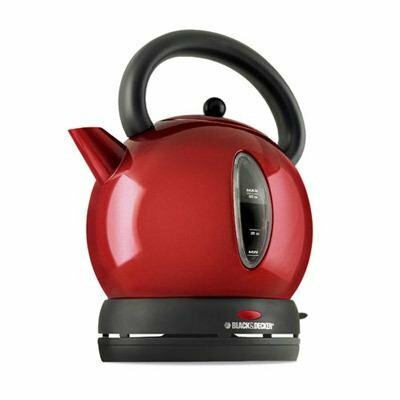 Nice looking kettle., but leaked after 1 year - Russell Hobbs where are you ? I got this kettle about a month ago. It's quite nice looking - very snazzy red color and the shape is quite unique. Aesthetically very pleasing. However, it has 2 major flaws. 1) it loses heat VERY rapidly. Once the kettle boils, you pretty much have to sprint over to it and use the water to do whatever it is you're going to do with the water, or it cools down and you have to re-boil it. I have a tendency to boil water, get up to something else for a few minutes, and then go make my tea. With this kettle I'd have to boil the water again and again before I was finally near the kettle when it went off. 2) it broke. The view window that allows you to see the water level in the kettle came loose and it started leaking. This kettle is really great looking, shiny red and curvy. However, the lid is very difficult to open once you have pushed it down in place. I have carpel tunnel and I almost couldn't get it open at all. The handle runs directly across the access to add water, and the handle doesn't move out of the way. This really does make it difficult to fill. i received this in october as a gift, and i've thoroughly enjoyed using it. this is the second electric kettle i've owned and the first made by black and decker. unlike previous reviewers, i've had no problem filling the kettle with water. the faucet clears the rim by more than an inch. yes, the kettle is hot to the touch. but it's stainless steel and filled with boiling water, so i didn't expect it to behave otherwise. the lid fits firmly. i see that as a smart safety measure rather than a defect. i haven't experienced any issues with hot steam so far. the placement of the handle is comfortable. i have left standing water in it for several days at a time. so far, there's been no leaking out the bottom or the sides, but i am staying on the alert for it.